Recently the Virginia Biosolids Council (VBC) hosted an informational session on biosolids for invited guests who represented a variety of organizations, including state and local government, agricultural and agricultural business organizations, conservation groups and companies that recycle biosolids on farm and forest land in Virginia. Mike McEvoy, who serves as President of the VBC and serves as the Executive Director of the Western Virginia Water and Wastewater Authority, the water and wastewater provider for the Roanoke area, said that several years ago there was an ongoing effort to provide general information on biosolids through regular meetings of various stakeholders, but those are no longer conducted and in recent years while there have been informational sessions, these were focused on specific audiences, like wastewater professionals. The goal of the VBC session was to provide basic information on current matters to a diverse audience. The list of speakers included Neil Zahradka, director of the Department of Environmental Quality’s biosolids land application program, who spoke on active and pending regulatory matters; and, Dr. Greg Evanylo, Professor in the School of Plant and Environmental Sciences at Virginia Tech, who spoke on recent research on Exceptional Quality (EQ) biosolids and recent science and research reported at the W3170 meeting. 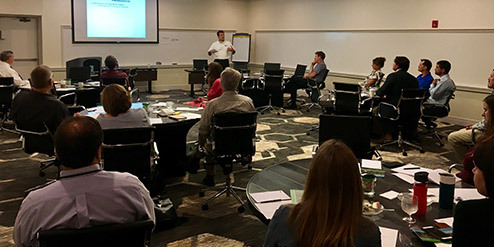 The W3170 is a group of scientists from around the country who are continuing to conduct research providing for the safe and beneficial recycling of biosolids and residuals. 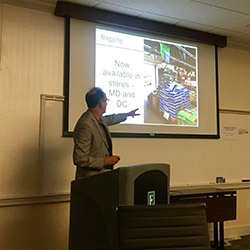 The third and final speaker was Chris Peot, Director of Resource Recovery for DC Water, who spoke to the rollout of DC Water’s Bloom (exceptional quality) biosolids in Virginia. In introducing the speakers and their topics, McEvoy said, “the recycling of biosolids is not new. It has demonstrated benefits to family farmers, improving soil and their production, but yet it is oftentimes misunderstood by the public, and while science guides its use and assures its safety to people and the environment, its use can be overshadowed by uncertainties and misinformation.” He said the informational session is designed to provide a “snapshot” on the use, regulation and science of biosolids.